Take your pick of these highlights from our Christmas events that are especially enjoyable for families and children. It is often said that children make Christmas. As adults, it can sometimes be difficult to feel the true spirit of the festive season when juggling work and financial commitments. There is no doubt that being surrounded by children and their innocent appreciation for such a happy, special time is contagious. Experience Christmas with the children in your life by making memories and filling it with family experiences that you’ll enjoy just as much as them. Your Cathedral is a special place to visit all year round. At Christmas time though, it feels extra magical. Here are our top family Christmas events. Experience the joy and peace of Christmas at Liverpool Cathedral where you can make memories of this special time together. Your favourite Christmas songs brought to life by the voices of over 250 children from seven primary schools, live band, dancers, choral trio ‘ROOTS’ and Santa Claus himself. Enjoy a magical evening for the whole family and join in your festive favourites as our infamous schools’ musical Christmas performance returns to Liverpool Cathedral. Come and join us to celebrate the true meaning of Christmas as the festive season gets underway. Bring your family and friends to this annual event, directed by Liverpool Cathedral’s very own Stephen Mannings. 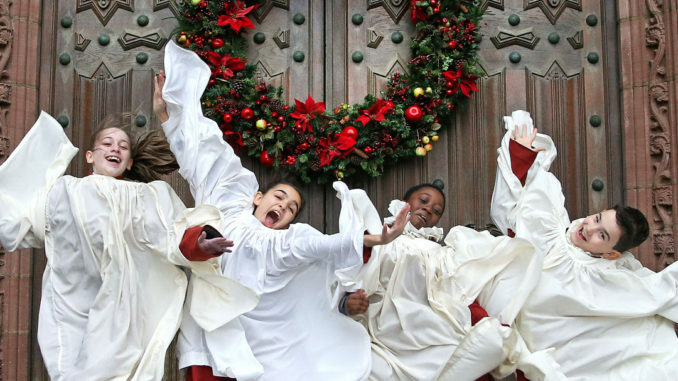 Featuring performances from several Liverpool primary schools, Liverpool Cathedral Junior Choir, the Metropolitan Cathedral Junior Choir, plus the wonderfully uplifting CARJ Circle of Voices Gospel Choir and the Liverpool64 Choir, it’s sure to bring you seasonal cheer. A service especially suitable for children and families with the Great Choir and a live Crib. Join us for our spectacular annual service for the whole family on the second Sunday of Advent. Sing along with the Cathedral Choir the well-known hymns and carols. During the service, the tree is lit and everyone gathers around the crib with its ‘live’ figures, as it is blessed for Christmas. Narrated by Dean Sue Jones and performed by 200 children from schools in the Merseyside area, it’s sure to bring the true meaning of the festive season home. The traditional Liverpool Christmas Carol Service, marking the journey from the Crib to the Cross, including the Procession of the Holly Bough. Come along to our service of readings and carols with the procession of the Holly Bough and Christmas trees through the Cathedral. Join us for our unique act of worship, specially devised for Liverpool Cathedral. Come along to this delightful service, the ideal preparation in the lead up to Christmas Day. This service has become so popular in recent years that we are offering it twice, so if you can’t make it at 2 pm, you can join us for the second service at 4 pm. Please note the change of times for this service. The traditional Christmas morning service with the ringing of the Cathedral Bells, the lighting of the Christmas Candle, and carols from the Great Choir. Something special is happening at the Cathedral on 29th December. Experience ‘The Snowman’ with a live orchestra and an animation of the Bear and the Piano by David Litchfield. Click link above for ticket info.